Idebe is a Integrated Development Environment for the OB1 PLC. 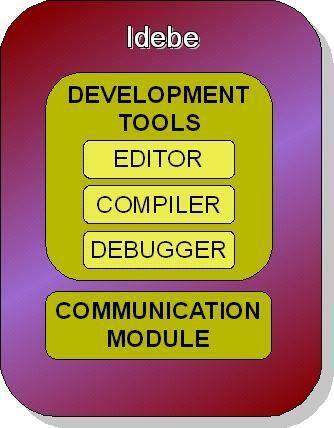 Idebe provides a programmable language, an editor, a compiler, and a debugger. Its goal was to create a tool to easily develop and debug application for PLC device. The first version of Idebe as been developed in C++ and Delphi. A new version is now under development in C#. The PLC and Idebe communicate using the serial port. More specifically the serial port is used for the following task: send the PLC user program from the editor to the PLC, debug the user program, monitor the status of the PLC, upgrade the PLC operating system. Here it is a screenshot of the graphical interface of Idebe. A program is a set of macro executed simultaneously (thread). One of the macro name have to be Program and this is the main macro. In this screenshot you can see the main macro (Program) and two secondary ones. The status bar is used to send the program to the PLC or to run it, to stop it etc. This panel shows the status of the digital input and output (on/off) and the status of the analog input and output of the PLC. This panel list all the avaible PLC instructions. The selection of an instruction open an instruction specific window and allow to set the instruction parameter.